Establishing themselves in 2017 with Berserker, Beast in Black feel the slate is now clean to delve into what they do best. Combining a rich love of melodic power metal with 80’s and dance/keyboard style aspects along with a healthy dose of cartoon/anime affinity, it’s this multi-layered synthesized approach that has been gaining steam worldwide. Founder/main songwriter Anton Kabanen and the rest of the quintet on From Hell with Love incorporate these influences into a catchy, explosive cocktail that should gain headbanging, fist waving approval immediately and consistently for those who yearn for hooks, melodies, and singalong choruses. The tones and orchestration/ keyboard spots possess that ripe 80’s throwback element – right away from the intro pulsation for the title track on through to the 8-bit plucking for “True Believer”, the latter given that added rhythm push from the steady groove and electronic supplementation. Replicating a Bon Jovi/ “You Give Love a Bad Name” atmosphere from the opening a cappella chorus on through to some Sambora-like guitar break pyrotechnics during “Sweet Little Lies”, you also get some Orden Ogan/Sabaton-ish choirs and triumphant keyboard/guitar syncopation during the militant power follow-up “Repentless”. Carefully making sure that the vocal melodies and phrasing are exact, singer Yannis Papadopoulos channels more of his dynamic range – gritty if necessary, ascending to the highest falsetto heavens convincingly but also showcasing a bit of a tender touch on the softer ballad “Oceandeep”. 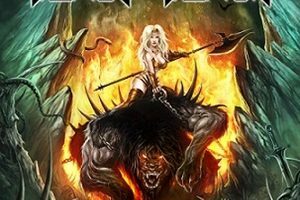 Ironclad shields spring to mind as you tackle the mid-tempo power riffs and forceful gang vocal spots during “This Is War”, a potent second half metal anthem for those who desire a Manowar-style arrangement. 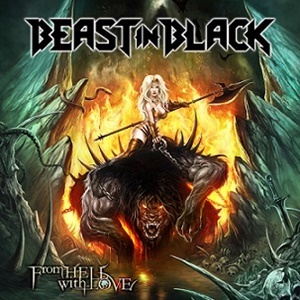 Beast in Black keep these songs moving at a radio-friendly clip – delivering 11 songs in 43 minutes. Aware of the fact that what they are doing may receive just criticism for its overt reference points and inspiration launching points throughout, it’s the way that Beast in Black incorporate their influences that makes this downright irresistible and uplifting if you are a follower of most power metal or enjoy the 80’s/anime passions.